Shri Varadvinayak Temple or Varad Vinayak Temple is one of the eight Ashtavinayak Temples in Maharashtra located in the Mahad village of Raigad District. Dedicated to Lord Vinayaka, the One Who Grants All Wishes, Varadavinayak Temple is set in the hilly region of Konkan which was known as Bhadrak or Madhak in ancient times. Varadvinayak Temple is the only Ashtavinayak temple where Ganapati devotees are permitted to personally pay their homage and respects to the Lord Ganesh idol (Varad Vinayaka). Shri Varad Vinayak Temple is about 20 km from Khandala, on the Pune - Mumbai Highway. This Ashta Vinayak shrine faces east (Purvabhimukh). The statues of elephants decorate the four sides of the temple. The dome of the temple is about 25 feet high with golden pinnacle. A Gomukh (meaning face of a cow) is seen on the north side of the temple from which flows the holy water. A holy pond is situated on the west side of the temple. 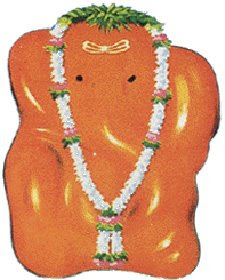 The idol of Varad Vinayaka faces east and is enshrined in the sitting posture, with his trunk turned towards the left. The stone idols of Riddhi and Siddhi are seen in the sanctum. A unique feature of Mahad Varadvinayak Temple is a lamp that is glowing continually for over a hundred years. Puja is performed three times a day. Celebrations are held during Bhadrapada and Magha Shudh Pratipada to Panchami. Vinayaka Chaturthi Festival or Ganesh Chavithi Festival is celebrated with great religious importance. Shri Varad Vinayak Temple at Mahad is 63 km from Mumbai, 25 km from Karjat and 6 km from Khopoli. The temple is 3 kms off the Mumbai - Pune Highway. Mahad Bus Station, operated by Maharashtra State Road Transport Corporation (MSRTC), connects the place with other major towns such as Khopoli, Mahabaleshwar, Karjat, Alibag, and Shivthar Ghal. Mahad can also be reached via Mumbai – Panvel - Khopoli road. Khed Railway Station connecting Panvel - Chiplun railway line is the nearest railway station. Matsyagandha Express, Konkan Kanya Express, and Mandavi Express are the main trains passing through Khed Railway Station. Chiplun Railway Station is the nearest major railhead. Mumbai Airport or the Chhatrapati Shivaji International Airport is the nearest airbase. Surrounded by scenic splendor, Mahad is a pleasant location for meditation as well to take bath in the nearby Ghats. The math of Gangangiri Maharaj is a notable site to visit. The place is also famous for the memorial of Dr. Babasaheb Ambedkar, who did the Satyagraha for the Dalits. Walwan’s Dam is another attraction. The Raigad Fort (Samadhi of the Shivaji Maharaj) located around 24 km from Mahad is another major tourist spot.